This family event that includes categories for both adults and kids will take place a the mouth of the Ameca River along the area known as El Tunel to the beach in front of the Isla de los Pájaros. 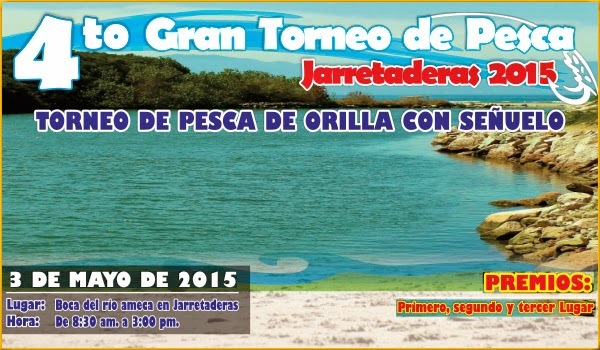 The 4th Jarretaderas Fishing Tournament will take place on May 3, 2015, from 8:30 a.m. to 3 p.m. not only in search of the largest catch, but also to bring families together and promote surf fishing with bait. The Groups and Events Department of the Riviera Nayarit Convention and Visitors Bureau is actively participating in organizing this year’s event in order to lend its support. “We're grateful that the CVB is a part of this tournament. As soon as I spoke to them about it, they immediately offered their support. We feel fortunate to work with them and we’re sure this year’s event will be even more successful thanks to this partnership with the CVB,” said Roberto Quezada, the tournament organizer. Roberto announced the pre-sale registration fee is $70 pesos through April 28th and $100 pesos on the day of the event. To date there are 70 people registered. The fee will include participation for one child under the age of 10 in a mini tournament for juveniles free of charge. The surf fishing for adults will be without bait, though children can use bait if they wish. The first three places will win prizes including fishing equipment, accessories and other gifts from sponsors. The tournament, which will take place at the mouth of the Ameca from the area known as El Tunel all the way to the beach right in front of the Isla de los Pájaros, includes the stipulation that only red snapper, bass, sea bass, mackerel and croaker weighing more than 1kg will be considered valid. During the fishing event there will also be a volleyball tournament held on the beach with music and plenty of fun to go around. At the end of the awards ceremony the participants will be treated to snacks courtesy of the organizing committee. To register, please contact 322 120 71 46.